First of all: Happy Summer! No one in So Cal was sure it would ever arrive, but finally the sun has burned off the marine layer, and it is summer at last. The sky is blue. The temperatures are rising. Our thermometer says "77˚ F," which is hot compared with the very low temps and rain of last week. It's not always a popular thing to admit, but I like the marine layer, the May Gray and June Gloom. Scorching heat is alright for zukes and melons. Mmmm... maybe for swimming too... Alright, I admit it: Even I am happy to see the sun, feel some heat, and get this season warmed up. I found the recipe for the salad Alex and Tamsyn made. And I made a small version for my dinner... crisp, cold salad is a summer pleasure. A few notes: I decided that "rucola" could be "arugula," and then I decided that Trader Joe's mixed greens with arugula = just what we need. We bought two different sizes of goat cheese, and what I did not realize until later is that one of the goat cheeses had honey in it (no wonder I was inhaling it like it was oxygen at the peak of Mt. Whitney.) So yummy. Goat cheese with honey = just what we need. 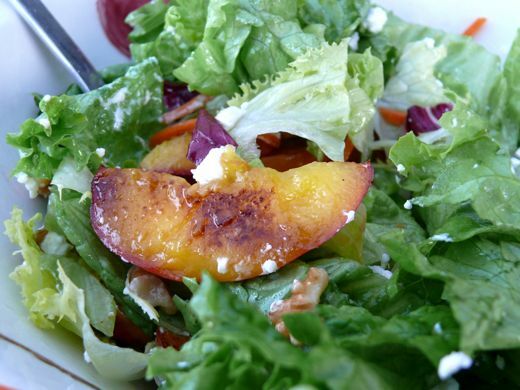 Tamsyn and Alex were very careful about following the recipe as it is written, but I did not peel the nectarines or measure anything when I made my personal salad... either way works. Both ways were scrumptious. Even with regular goat cheese, instead of the honeyed one. When playing farmer I find that there are always tweaks and adjustments that are necessary. Maybe it is because I am an amateur farmer, an unprepared farmer... whatever. 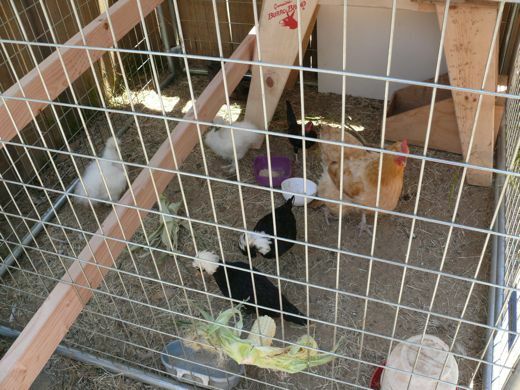 All the chicas have been sleeping in the original picnic table coop conversion, and cruising around in the side yard. The trouble is they escape the side yard, and they pillage the veg beds. Chaos! Anarchy! Woe, the poop deck! So, I decided to upgrade the shark cage for permanent living. 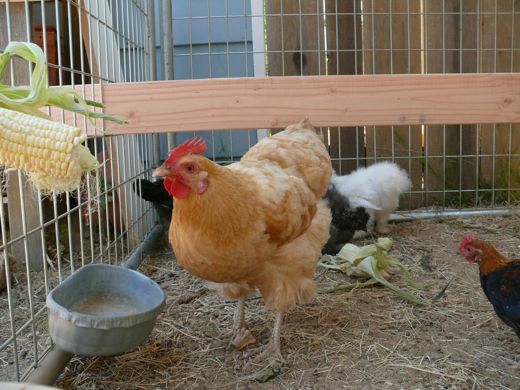 At the lumberyard I scavenged to pieces of fifty cent wood for roosts, and I bought a sawhorse to hold up the nest box. I have always wanted to own a sawhorse. For twenty years or more I have tried to dream up a good excuse to purchase one or two of these. I love their sturdy, ready to work posture, and their rugged versatility. 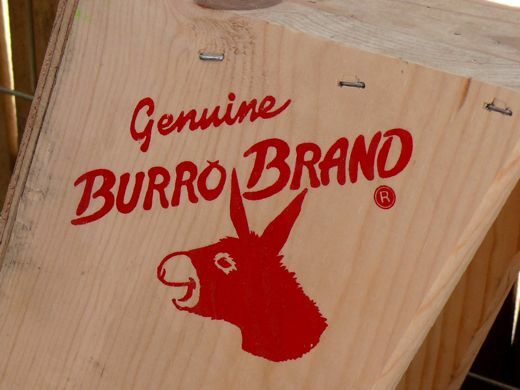 My excuse might be somewhat flimsy, but I am in possession of my very own little burro. Now in the shark cage there are two roosts, and two nest boxes, and a very helpful burro. And everyone seems to be settling in to the more spacious abode. Betty is the matriarch. No doubt about that. If it looks like a rooster. 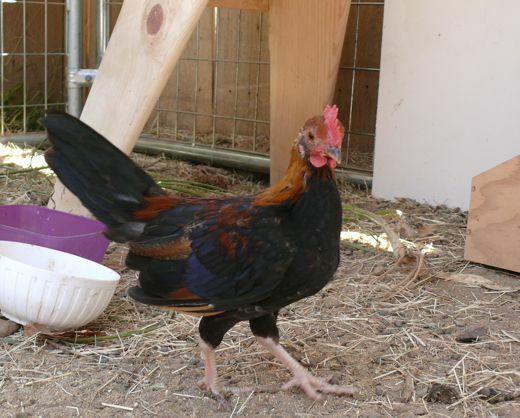 And sounds like a rooster. 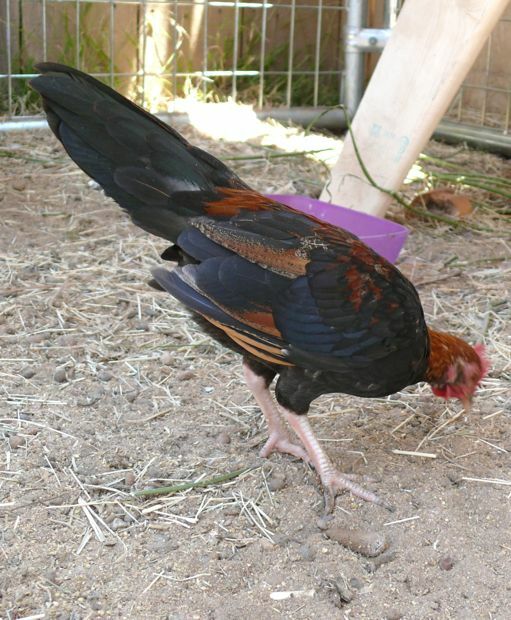 Could it still be a hen? 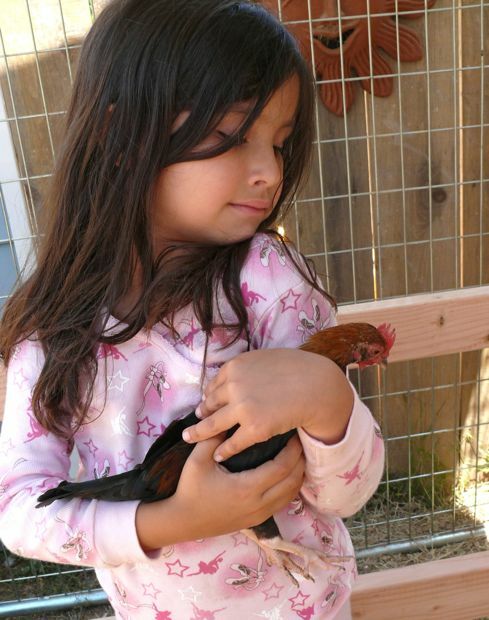 Remember our little chica? How petite and feminine she was? How hen-like? This one likes to bump chests with Zoe and Tesla. We are missing Alex. Happily he is making the most of his time and opportunities while staying in Oregon. We enjoy hearing from him. Max hung out with his buddy Lucas. William found new shorts he likes. Maria is looking forward to a swim. We are going to have another movie night soon. Geoff got outsmarted by a gopher... there is a battle impending. Joe has been loving his garden excursions, especially when he slips under the gate and goes galloping through the ivy. The ratty-rats are as amusing as ever. Don't worry until you hear the adolescent, strangled attempts to "cockle-doodle-doo!". 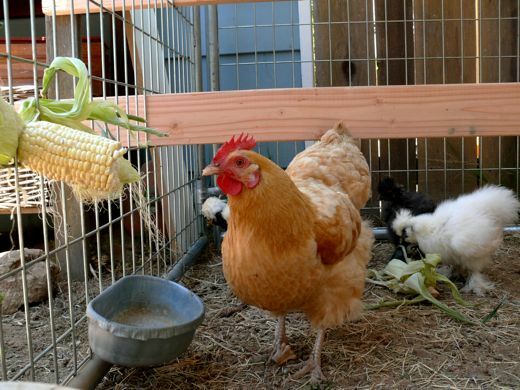 Chances are, the pullets are just readjusting their pecking order. I'm keeping my fingers crossed for you :-). I love these pictures! I have a secret desire for a sawhorse too!!! From those gorgeous fluffy feathers, who knew?! After all your years of waiting, it's so good to see you thriving in your own little mini-farm. It all looks wonderful. I am having a little giveaway and would love for you to take part in it! So drop by when you can. Enjoy a lovely coming weekend. So much goodness. The best, everyday kind. Delighted that the sun is shining for you in so very many ways! 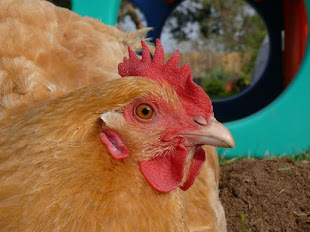 Zoe is a beautiful "hen!" Right?? oh my goodness! 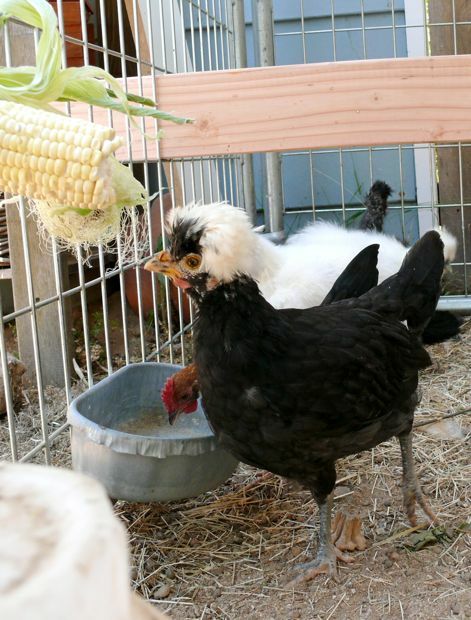 that black chicken looks like it has a white wig on! haha. too funny. Zoe looks very roo-ish to me, but I'm not an expert on that breed, so I could be wrong. Whichever it is, call it gorgeous! That coloring is awesome.